Lanzarote is the fourth largest of the Canary Islands, found toward the easternmost side of the archipelago. A tad quieter than some of the other islands, such as Tenerife and Gran Canaria, Lanzarote is a top choice for families and couples looking for a relaxing holiday in the sunshine. Found on the eastern coast, Puerto del Carmen is the most popular resort in Lanzarote, where you’ll find all sorts of daytime and evening activities to enjoy, including beaches, water sports, harbour, restaurants, bars, nightclubs, shopping centres and a variety of accommodation. Playa Blanca in the south is the second busiest resort and incorporates many alluring beaches, historical site, bars, restaurants and shops. Costa Teguise is the third most popular resort and is much quieter than the previous two. This resort offers many similar services and facilities as Puerto del Carmen and Playa Blanca, as well as four- and five-star hotels, golf course, water park and aquarium. Just like the other Canary Islands, Lanzarote is of volcanic origin and due to the warm, dry climate, many of the volcanic landscapes today look exactly as they did when the volcoes first erupted hundreds of years ago. The volcanic scenery found on this island is truly stunning and includes the Atlantida Tunnel which, at 7km long, is the longest volcanic tunnel in the world. In addition to the incredible volcanoes, Lanzarote is also known for its breathtakingly beautiful beaches which are found all over the coast. Despite the island’s volcanic origin, many of these stunning bays feature powder-soft golden sands which are quite rare in the Canaries. 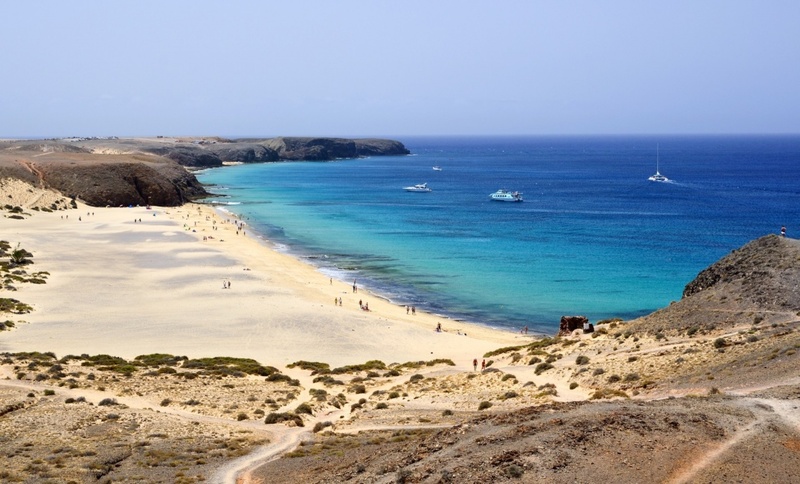 If you’re a sun-worshipper, check out the beaches at Playa Blanca and Papagayo – they’re some of the best on the island and feature world-class facilities. Thanks to its location, some parts of Lanzarote enjoy – or suffer from, depending on how you look at it – almost constant winds. Whilst these blustery weather conditions can be a hassle if you’re trying to sunbathe or enjoy a picnic, the winds are ideal for practising water sports such as surfing, body boarding, wind surfing and kite surfing. Famara and Costa Teguise are two of the best spots to go to if you want to try your hand at these exciting water sports. If you’re looking for a laid-back island where you’ll be surrounded by intriguing scenery, gorgeous beaches and unparalleled weather, Lanzarote is the ideal holiday destination for you.